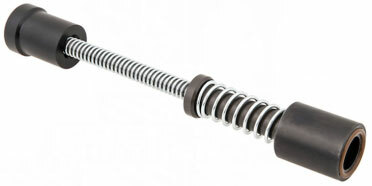 The Stealth Recoil Spring comes in 5 variations. SRS-Carbine at about 3.3oz equivalent SRS-H at around 3.8oz equivalent SRS-H2 at around 4.7oz equivalent SRS-9 at around 5.3oz equivalent and SRS-H3 at around 5.6oz equivalent and SRS-308 5.7oz. Pat. Pend.